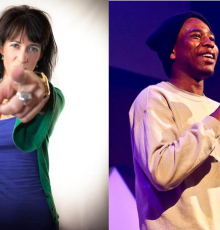 Our second show of the season will feature Sally-Anne Hayward, whose performance last year was awesome, and another award winning comedian Michael Odewale, performing in Brussels for the first time. Here's another comedy night not to be missed! Sally-Anne is an award-winning comedian (Holsten Pils 'Fans of Comedy' award) and a sought-after corporate performer (with clients including Orange and Alcatel). She has performed all over the world and has provided tour support for Sarah Millican, Russell Howard and Russell Kane.